My divorce and post decree clients that have people with traits of toxic narcissism often struggle with trying to explain or discuss what it can be like living with someone with such toxic traits, especially when the person is able to maintain a facade of normalcy on their work or neighborhood relationships. Sometimes, I have to coach clients to understand that it can be difficult persuading others as to how emotionally damaging these relationships are, especially when the narcissist is “high functioning,” or otherwise able to disguise their abusive behaviors from the rest of the world. 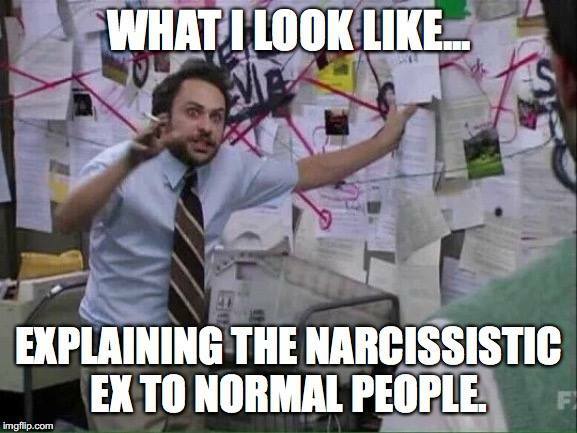 Living with someone with a toxic narcissistic personality disorder can be brutal, especially when the narcissist uses the relationship to emotionally abuse their partner, and tries to turn children, neighbors, and even family members against the otherwise healthy partner. 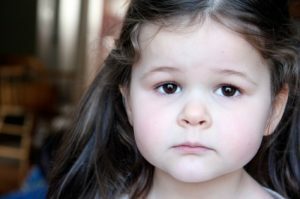 DuPage Divorce: Is Child Custody Different with Divorce and Parentage? If the custody or parenting time of a minor child is at issue before a court, should the legal process differ depending on whether the parents of the child at issue were married? 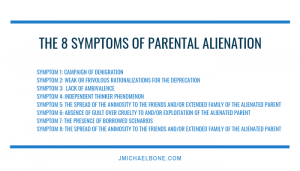 Dr. Michael Bone has a series of articles on Parental Alienation that are thoughtful and effective. One of the issues that he raised recently was the need for lawyers that represent targeted parents to “step up” and actually give voice (as I like to call it) to the reality that the other party is committing acts of PA, and making false allegations. In other words, it is not enough for a lawyer to simply defend a PA case. In my view, the act of PA is child abuse, and if we look at PA from that angle, any parent that is committing a form of child abuse should be seen as an abuser, and the “target,” as it were, needs to be painted on that offender’s back. The Court needs to know that the alienating parent is guilty, culpable, and needs to be stopped and sanctioned by the Court. ” Very often, the targeted parent will have been accused falsely of being in some way dangerous, unstable or otherwise suspect as a parent. Since the court should always carefully examine any potential danger that such a parent might represent, it should then also recognize that the fact remains that parents are falsely accused of tendencies and acts that are not them. I have included below most of the text of the amended Illinois SB 4113, which seeks to establish a rebuttable presumption that an award of equal parenting time to each parent is in the best interests of the minor child(ren) in a divorce case. For many years, my firm has represented Fathers in complex child custody cases, and in many cases my Dad clients were rightfully awarded the primary custody of their children. I have fought vigorously to level the playing field for my Dad clients through the years, some who faced false allegations, false OPs and other challenges in their divorce cases. These cases can be battles, but with the right strategy and management, the right decisions can be reached in these cases. Equally so, I have fought for women, in their own custody cases, some facing false allegations of parental alienation from a narcissistic husband. My goal has always been to develop strategies for both my male and female clients to combat parental alienation, false allegations, and to create outcomes that serve both my clients and the true best interests of the children. So with SB 4113, the question becomes whether this legislation will, in and of itself, create that level playing field for parents? I note that many of the more vocal Bar associations have opposed this bill, and I can say that some judges with whom I have discussed this do not favor the bill. But, the idea of such a bill has a lot of favor, especially with men and women who, for too long, have been impacted by a legal system that oftentimes does not serve the best interests of children fully. Will SB 4113 create that foundation so that the court is required to factor in a presumptive 50/50 allocation of time to both parents? I am hopeful that SB 4113 perhaps undergoes some revisions that might make its passage more palatable. I note that a 50/50 presumption is a satisfying idea, but that in many cases, many judges and clinicians do not believe that a 50/50 time allocation is appropriate in most circumstances and with most families. An equalization of time is beneficial where the parents live proximate to each other, where the parents both share positive parenting traits, work schedules can accommodate 50/50 time, the age and circumstances of the kids favor shared time, and myriad other factors that can benefit a true shared parenting environment. I believe that a shared parenting bill could be written that might be more dense, more detailed and more fleshed out that might give a solid and detail-rich shared parenting bill a real likelihood of passage. I believe in and support shared parenting, in those cases where it is the right thing to do for both parents and kids. In cases where there is negative parenting, parental alienation, and/or domestic violence or psychopathology, I also believe in rooting out these pathologies and restricting parents that harm kids and the other parent. SB 4113 now moves on to the full house for consideration, and it will be interesting to see whether it reaches the desk of the Governor for signature in its present form. 1 support of the deviation from the presumption. 18 relationship to the child. 18 preponderance of the" to "a preponderance of the". An article published in one of the leading bar journals discussed the use of social media postings as evidence in court cases. The article happened to concern a criminal case, where a Facebook posting allegedly made by a defendant using his mother’s Facebook page had statements from the defendant admitting to the time, place and means of the crime. Certainly Facebook and other social media are much more often employed these days in divorce and child custody cases, where parents try to assemble negative information and evidence concerning their spouse’s behaviors, infidelity, or use the social media platforms to stalk or otherwise gather information about their former partners and their habits and behaviors. Whenever evidence is to be used in a court hearing, the evidence must meet certain tests for reliability. One does not have to be a forensic IT expert to know that a fraudulent Facebook page or identity can be created, or that a post can be posted by someone claiming to be another person. Because of the nature of this possible lack of trustworthiness, courts have struggled to define the foundations that must be laid in order to admit social media evidence. Social media evidence has garnered the most distrust. As one court explained, “[t]he concern arises because anyone can create a fictitious account and masquerade under another person’s name or can gain access to another’s account by obtaining the user’s username and password.” Another concern is that regardless of whether the information is genuine or fabricated, it is “available by performing a Google search… forever,” giving the impression that it is accurate and true. Griffin v. State, 19 A.3d 415, 421-22 (Md.) Generally, a witness authenticating electronic evidence must “provide factual specificity about the process by which the electronically stored information is created, acquired, maintained, and preserved without alteration or change, or the process by which it is produced if the result of a system or process that does so.” As pointed out by Griffin, the “most obvious method [of authentication] would be to ask the purported creator if he/she indeed created the profile and also if she added the posting in question.” Id. The Illinois legislature is considering now a Shared Parenting bill that would create a legal presumption that shared child custody and parenting would be the “presumed” status for divorcing parents, absent a showing that such shared parenting is not appropriate. I have had a chance to discuss this bill with some of the judges with whom I appear before (it’s not unusual for experienced lawyers and judges to talk about important issues in private settings, without discussing specific cases). I’d say that the majority do not support presumptive shared parenting, insofar as the limitations created by such a bill would be problematic in ways that are discussed in the article, below. The other side of the coin with this issue is that, in my experience, without “push” from the legislature, many judges still consider some parents as “visitors” in their children’s lives and resort to recommending parenting schedules that are anachronistic, and akin to the “standard order” visitation schedules that were common in the last century in many Illinois counties. In my practice, my approach and view is that every family system is different, and there is no “one size fits all” approach that works for a parenting plan after divorce. Many myriad factors need to be evaluated and considered, with the aim of providing the children with the best possible developmental outcome from the divorce of their parents. For good and loving parents, the children should have substantial contact with both parents; the clinical research supports this idea. For parents with deficits, or histories of personality disorders, substance abuse, or violence, or traits as parental alienators… the standard is very different, and the parenting plan needs to address these problematic issues, too. ” He or she isolates you from your longtime friends and family.